Flexson launches Sonos Amp wall mounts from £50/$70 | What Hi-Fi? UK Sonos accessory specialist Flexon has a vast collection of dedicated wall mounts and stands for every Sonos product, so with the recent arrival of the new (and mighty fine) Sonos Amp, it's not surprising that a Flexson accessory or two is hot on its heels. Flexson has expanded its Sonos accessory range with three new wall mounts for the Amp. The 'SA-WM Wall Mount for Sonos Amp' (£49.99/$69.99) does exactly what it says on the tin, allowing you to attach the Amp to a wall (or even to the back of your TV via VESA brackets). A cable cover keeps ugly wires out of sight, too. Got multiple Sonos Amps? 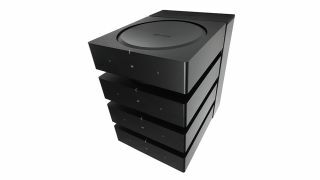 The SA-X4WM (£264 / $249.99) is a larger version that can mount up to four units with similar cable management , while the SA-X4DK Dock (£159.99 / $224.99, pictured top) can also hold up to four Sonos Amps, but in a stacked arrangement in a single unit that can be desk- or wall-mounted, or secured to the underside of a cabinet.